by Olivia Snyder in Family Budget | 24 comments | Contains affiliate links. 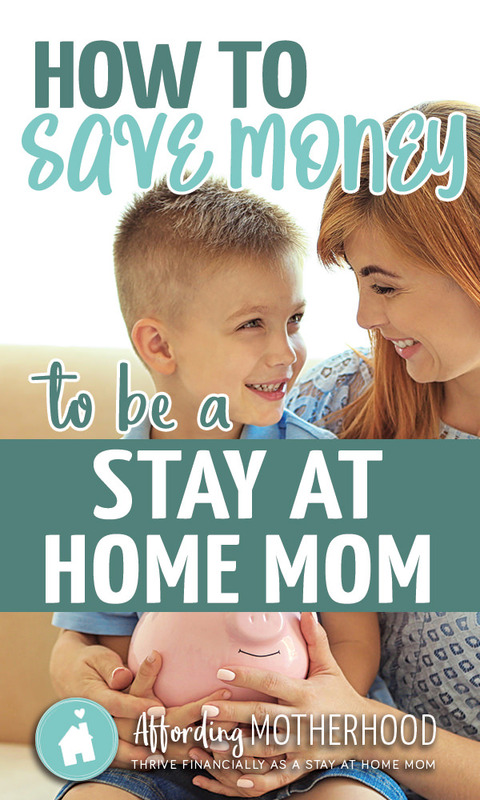 A frugal stay at home mom shares her best tips for stay at home mom budgeting and saving money – so you can be home with your kids instead of away at work. I’m so excited to share something dear to my heart with you Affording Motherhood followers – SAVING MONEY! My husband and I made it a goal to pay off our house in 7 years (with a 15-year note), so I would be able to stay home with our kids when the time came, so saving is my best friend. We were both teachers and did not have kids yet. We doubled up on payments for a while and then started paying more and more, beating our goal by 4 years and paying it off in 33 months (A $110,000 loan)! Here we are, years later and I’m a stay-at-home mom with no debt, still saving for college and retirement. So here are some stay at home mom budgeting tips I find useful to show you how to financially prepare to be a stay at home mom! This is the #1 way to start saving. Why? Because you see exactly where your money goes and how much spending you can reduce when it’s laid out in front of you. Once my husband made me control more of the budget, I really started saving money. I’m amazed by how many people don’t have a real budget. When I say “budget,” I’m talking three important things on it: Category (i.e. Groceries), Budgeted Amount ($400), and Every Expenditure (every trip to the store that was for groceries (see our budget below). I could go on and on about a budget, but the main thing is to get one in writing and start using it. You will be amazed at how much you’re spending and how clearly you can see your money. Trust me, I know how easy it is to let the credit card statement be your budget. We’re CONSTANTLY revising our budget…and we get better and better each time! 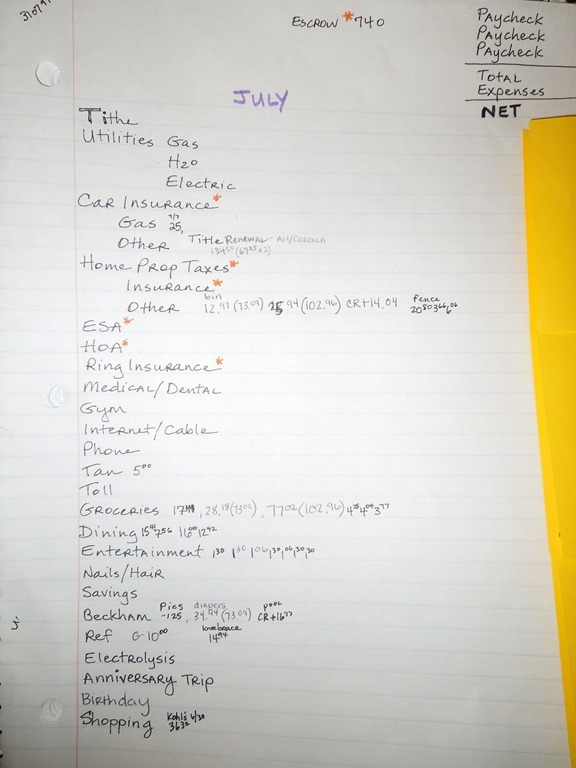 Our Budget – written on paper, old school, but it works! We watch a ton of movies. We also buy seasons on DVD (or ask for gifts) and watch them in the summer! This is an easy way to save a lot of money each month. I’ll be honest…I wish we had DVR so I could record shows, but I like saving money so I can stay home with my baby much better. We pay $69 for the Internet AND Basic Cable (have to have this for TV). Shop often for different rates for insurance and electricity. There is almost always a better deal out there. My husband changes electricity companies, almost monthly, for the best rate. I think that’s a bit extreme, but he’s in charge of that. Texas summers are brutal, so A/C is a must! We keep it at 77-78 degrees in the summer and our bill is between $100-175 a month (for a 2000 sq ft house). I love food so this one is hard for me, but most Americans overspend on groceries. I know this will differ for each family, but my rule of thumb is $100 per person in the household. We have three, so we should spend about $300. We actually spend around $360 (this is everything except diapers). I’m hoping when we have more kids, we’ll stick to that rule of thumb. When Ryan and I were first married we spent $280 a month. You can check out my detailed tips for grocery shopping here. Menu planning and ads are key for us. 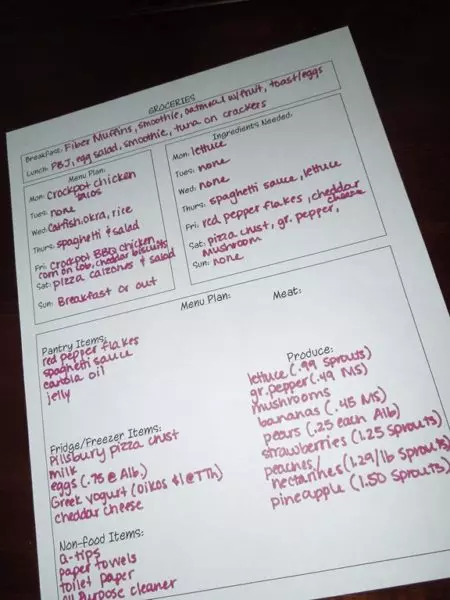 My grocery template with meals and items to buy. I love to eat out! Therefore, we have to find ways to save in this category. I have tons of tips here. Coupons are the key for us in this department. We budget about $100 a month for dining out (this includes fast food, restaurants, and my must-have Starbucks every once in a while…any food outside the house). Sounds easy, but surprisingly, the majority of Americans do not follow it, hence the debt crisis. Viewing money differently is important to saving. If you want to save BIG, there are TWO major things you should focus on: HOUSE and CAR. I won’t go into detail here, but the following are important for each. The key is to buy the right house first. Your mortgage should NOT be more than twice your household’s total annual income. For example, if your household income is $80,000, your loan should not be more than $160,000. Of course, this a general rule, but the point is, your mortgage should be lower than you think it would be (definitely lower than what most Americans buy). Also, get a 15-year note! Here’s a recap of how to budget and save money to be a stay at home mom. What are your favorite money saving and budgeting tips for your family? Olivia Snyder is the writer at Joyfully Prudent: Prudent Living, Simple Solutions, Joyful Journey. The blog is a culmination of all things Snyder (finance, money saving tips, family, recipes, and more). 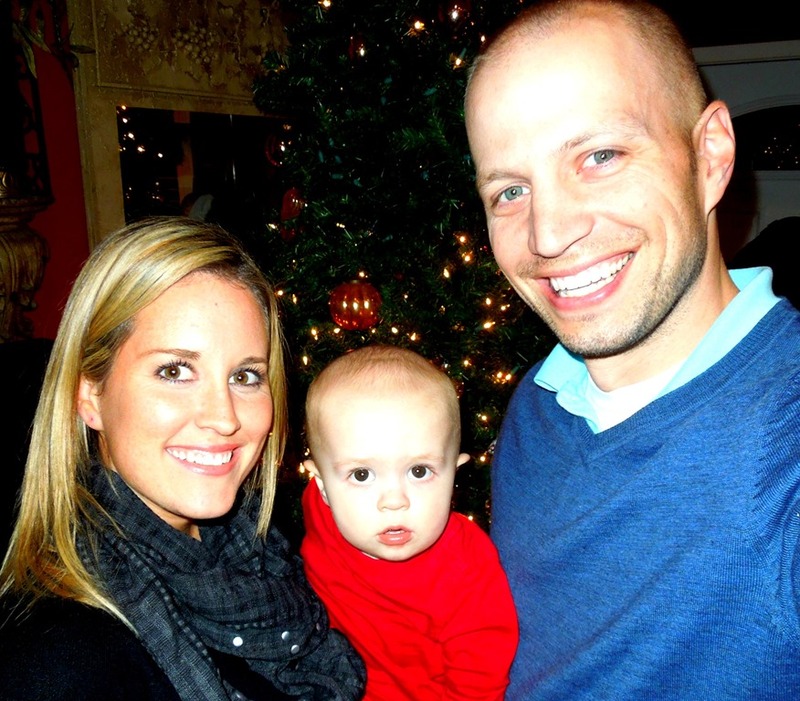 She’s a former teacher, called into being a stay-at-home mom to her adorable children. She spends her “free” time blogging, making printable signs for Joyful Art Designs (on Etsy), and playing soccer. She and her husband live in Texas. God is good! Thank you Andrea! Groceries are the hardest for me too. It seems that they just get more expensive too, especially with children. I might have to be one of those couponers :) I’ve heard great things about mint.com. That’s awesome…whatever helps you stay on track. We break up a lot of transactions into different categories on our budget, so the online programs don’t work well for us. We’d have to visit it to much to input manually. I’m sure one day we’ll find something online we like…I have to bust out the calculator too much…Lol! Another way to save is look in your neighborhood for stores that arent name brand they tend to be cheaper. My favorite here in OK is Aldi. I dont have to use coupons its quality food, but no name brands.ALso if you do buy in a name brand store use there brand or the generic brand, it svaes a ton of money. Also check unit prices. I do at SAMs Whole sale/Walmart. That also saves a ton when you know what you buy and price it all your local stores to see the best deal. I save my reciepts and compare prices to help me save. I also make sure I’ve eaten before I go shopping it saves me from getting junk I dont need. Last thing Always make a list, dont shop by the fly, meal plan and you’ll be sure to save money. By the way I shop for a family of 7 we spend about a average of $800 a month. I also do freezer meals to save me time in the busy week. Great tips…although, honestly, I can’t part with my cable. Sorry, I just can’t. It was the one luxury that I signed up for right when I graduated from grad school. But I totally agree with the others – especially the groceries and dining out. They are huge budget killers in our house! I am AMAZED that you paid off your house in 3 years! That’s just incredible. Thank you Suzi…it is the MOST incredible feeling of freedom. A feeling I can’t really describe! I wanted to add that, of course, this was accomplished by God’s grace and blessings towards us and our hard work! Without Him it would not be possible! I appreciate your tips Olivia, but disagree on the 15 year note & paying off early. Depending on your income and interest rates, paying off your mortgage early or getting a 15 year note may actually cost you more money. While it would be nice to not have a mortgage payment, the money we save on taxes combined with the future devaluation of the money make it better in our situation to have a very low interest 30 year fixed mortgage and pay it on time. Said in another way, with the low interest rates, you can do much better with very low risk investments putting the money to use (to save for college, etc.) than paying off your mortgage earlier. And then there is the tax deductions for mortgage interest. I was doing as you described when our financial planner explained why it wasn’t such a hot idea. Each situation is different, so definitely get advice from a trusted expert for each situation. Jonathan, thank you for your comment. We might have to agree to disagree on this one. While every situation is not the same, no one will ever convince me that tax deductions is a reason to have a mortgage. Is it a benefit to a mortgage? Sure. A benefit MUCH SMALLER than having TONS more money a month, freedom of being slave to the lender, never having a mortgage again, and years of saved money that can be put into retirement, college, etc. I’ve heard this argument a million times from people in debt. Dave Ramsey has tons of examples of this myth on his website and in his book. His Total Money Makeover addresses this quite nicely with numbers to prove. Again, there are rare cases that may not apply, but I’ve only heard of one and that usually involves elderly folk. If you’re interested in research about it, that book is great (I’m not affiliated with them at all). Thanks again. Thanks for the tips!! I always try to stick to a budget. Ashley, you’re already miles ahead of most people! Keep at it! It’s hard to stick to a budget, but it’s smart! Just found your blog and love it! Except double our income wouldn’t even buy a trailer where we live! Our household income is about 80,000 and our mortgage is 250 for a 800sq foot apartment! Oh goodness! That is some high cost of living! We are fortunate to live in Texas where the cost of living is really low. In your case you would definitely have to spend more in the housing category and it might take longer to pay off (if that’s even a goal). Thanks for reading Taren! This is a great post. We do everything you mentioned as we are trying to pay off our mortgage as well. Thank you for the inspiration. Some days are tough, but it is wonderful to hear the successes of others. Thanks, again, for sharing! I was just looking through your comments and noticed that mint.com was mentioned. They’ve recently done some updating and I think it has made it even easier to use. Most everything is automatically assigned to the correct category and expenses can be broken down into multiple categories. I mostly use it for the ‘trends’ option, but the visual on how much money has already been spent towards a specific budget is nice. I also like the bill reminders. I do most of my budgeting on paper, but I do like using Mint as an extra tool. I will have to check out mint.com again. Anything to make budgeting easier. Thanks for the tip Keli. Have you tried a digital antenna for TV? We got rid of cable and use over the air. We only get local programming but I watched too much TV before, anyway. Great tip Martha! We have a digital antenna for our TV so we can catch the Olympics or other special events when they’re on. Otherwise, we just watch Amazon Prime. I just found your blog, and literally LOVE every tab!! I have been struggling with my family of 6 (me and hubby 10y/o 8 y/o 4 y/o and 2 y/o) I have recently started budgeting and diving into dave ramsy’s plan, and while we save a lot more, i still find us spending more than we need to, and im having to work full time as a waitress to make ends meet while still following ramsys plan. I want so badly to stay home with my babies and feel good about it! We dont have cable; and i actually only spend about 550 a month on grocieries! (Thats including all household goods and diapers). Our cars are paid off, but were still struggling. My hubby is just now recently on board with a budget, but he likes to be more in control of budgeting, and i feel he budgets too much for “Us money”. Making excuses that “You only live once” and im not sure he is willing to forgo spending on himself, and even tries to sway me to spend more on myself, as well. :( That is the biggest reason that I chose to start working full time.. (I had been a SAHM for 3 years); I feel that if I dont work, we wont get where we need to be. The money I make working goes towards the dave ramsy plan, while the money he makes goes twoards bills, and other things like that… He just doesnt understand that I want us to be financially free!! What are your tips for this situation?? Any advice is so greatly appreciated!! Chelsea, That’s great that you’re working your plan for financial freedom. Your grocery budget is right on! Probably my best advice is simply that it often takes time to get husbands on board with the budget. I took my husband quite a while. But now that he is we work as a team and he may even be more frugal than I am now! :) Be patient and continue to do what you know is right in the categories that you have control over. I know it can be tempting to overspend or to give up on your budget when your husband isn’t going along like you want him to. But typically women have a big impact on many budget categories which gives a lot of opportunities to save. You might also want to check out my post all about how to get your husband on board with a budget. I hope you get to go back to being a stay at home mom again soon! Do you plan to send your children to public or private school? We desire to send our children to a Christian school but it’s quite a bit of money to budget for and be a stay at home mom. We began homeschooling for this very reason. We wanted them to have a high-quality Christian education, but can’t afford the private school tuition, so that seemed like the best option. We loved homeschooling, but unfortunately weren’t able to continue and ended up putting them in public school. I’ve been very happy with it for the most part so far. We just take it year by year, and maybe in the future we will be able to send them to private school.